Captain Marvel is set to go higher, further, faster when her solo flick soars into cinemas on March 8 — but a swarm of internet trolls are bent on bringing her down before her silver-screen debut. Dozens of registered users on Rotten Tomatoes have begun flooding Captain Marvel with negative reviews, lodging hateful comments in the audience reactions tab. 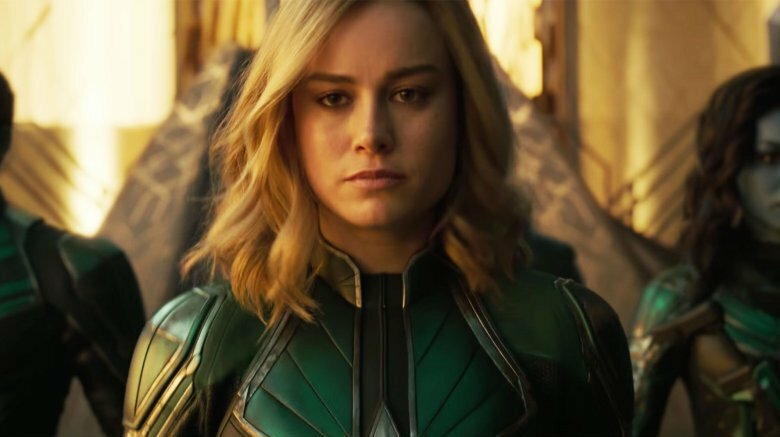 The majority of the unpleasant reviews focus on lead actress Brie Larson, with many making misogynistic remarks about Larson's outspokenness as a feminist and an advocate for inclusiveness in Hollywood. In the same vein, other nasty reviews that don't vilify Larson personally disparage Captain Marvel as a whole; a sizable portion of people out there believe that the film highlighting feminism and a girl power message somehow undermines the rest of the Marvel Cinematic Universe. "Larson has made it clear… men need not attend this movie," one user named Joseph U. wrote, while another identified as David S. argued that Larson "doesn't want" white males to see Captain Marvel. "Larson's sexist and racist attitudes don't want me to spend money on this anyway, so here you go, Ms. Larson," a user by the name of Caleb W. typed out. Yet another slammed Larson as viewing men as "the enemy." They wrote, "I somehow feel that [the Skrulls] are not the enemy, but that I am, since Brie Larsen [sic] has been careful to state she doesn't want the Press Tour to include types like me." An anonymous reviewer went full-tilt vicious in writing, "Why Marvel decided to cast a very vocal racist and sexist aimed at white males, I'll never know. If Robert Downey Jr. started saying that he didn't care about the opinions of 40 year old white chicks and he doesn't want to be interviewed by a white woman as its not inclusive enough, people would lose their minds. His career would be over, branded a racist and sexist, attacked in the media and his legacy tarnished. As a white male, I will not be supporting this or any other movie that stars Brie Larson. They say that Captain Marvel will be the new face of the MCU? As the villain because she certainly isn't a her-o." A user by the name of David T. posted that he "would not shed a tear" if Larson got "hit by a bus," and berated Captain Marvel as an "SJW laden, white male hating worthless POS movie." He added, "You could not pay me to see this … I am sick of this identity politics taking over pop culture." Continuing the trend of denouncing Larson as some sort of man-hating villain, someone named Aaron G. wrote, "Once Brie went on an anti-White male tirade I lost interest in this movie. What should I pay to see a woman who hates White men. She can wallow in her own hate filled life." Charles H., who stated he is a graduate of the United States Air Force Academy just like Larson's character Carol Danvers is, denigrated Captain Marvel and called Larson a "bore SJW." He wrote, "I think I will save my money. Too bad. I can't wait until the SJW movement dies and America can get back to true progressive politics." 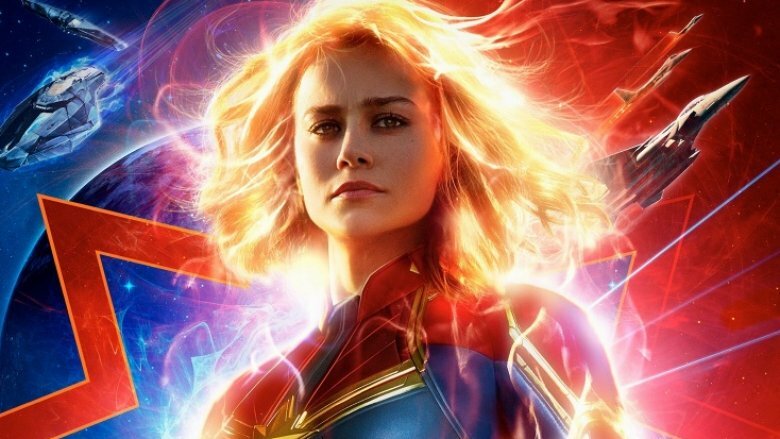 Other distasteful reviews on Captain Marvel, which are largely written by men but do feature a few from women, include "tired of all this SJW nonsense" and "as a white male I don't think Brie would want me watching this movie." One reviewer wrote that Captain Marvel represents "another story ruined because they took the male out and put in a female," and called women "the biggest copycats in the history of the world." Two more users typed out, "Wish the lead actress wouldn't have injected her dislike of white men into the discussion. A complete turnoff. No thanks," and "Have no interested in watching a movie starring a man hating feminazi." As is clear, "yikes" doesn't even begin to describe what is happening here. But why exactly are so many sending hate toward Larson and Captain Marvel? It seems that Larson's past comments about including more people of color in the press junkets for Captain Marvel are the reason for all these ruffled feathers and unsavory reviews. On February 7, Marie Claire published a piece in which Larson spoke with journalist Keah Brown about Captain Marvel, feminism, the current state of film, what the world can to do make the film industry more inclusive, and what being a part of the MCU means to Larson. During their chat, Larson also revealed why she hand-selected Brown to be her Marie Claire interviewer during the Captain Marvel press tour. "About a year ago, I started paying attention to what my press days looked like and the critics reviewing movies, and noticed it appeared to be overwhelmingly white male. So, I spoke to Dr. Stacy Smith at the USC Annenberg Inclusion Initiative, who put together a study to confirm that. Moving forward, I decided to make sure my press days were more inclusive," said Larson. "After speaking with you, the film critic Valerie Complex, and a few other women of color, it sounded like across the board they weren't getting the same opportunities as others. When I talked to the facilities that weren't providing it, they all had different excuses." She continued, "I want to go out of my way to connect the dots. It just took me using the power that I've been given now as Captain Marvel. [The role] comes with all these privileges and powers that make me feel uncomfortable because I don't really need them. It's a by-product of the profession and a sign of the times. But any uncomfortableness I feel is balanced by the knowledge that it gives me the ability to advocate for myself and others." Larson has consistently been vocal about the importance of equal representation, and noted during last year's Crystal + Lucy Awards that the lack of it in film criticism is an "issue that's been bubbling" (via IndieWire). The actress stated that she doesn't "hate white dudes," but was trying to drive home the point that if a movie is "a love letter to women of color, there is an insanely low chance a woman of color will have a chance to see your movie and review your movie." Larson also said, "I do not need a 40-year-old white dude to tell me what didn't work for him about [A] Wrinkle in Time. It wasn't made for him. I want to know what it meant to women of color, to biracial women, to teen women of color, to teens that are biracial." Sadly, it seems many may have gleaned from these statements a different meaning than Larson's intended one. And even more unfortunately, this is hardly the first time a blockbuster film top-lined by actors who aren't white men have faced harsh reviews ahead of their official release. Black Panther suffered pre-launch backlash when an alt-right group by the name of "Down With Disney's Treatment of Franchises and its Fanboys" attempted to sabotage its Rotten Tomatoes score. The group created a now-deleted event titled "Give Black Panther a Rotten Audience Score on Rotten Tomatoes," and wrote that it was "time to strike back at all those under Disney and bring down the House of Mouse's actions for paying off the critics that hurt DC Comics on film and for other parties affected by them." That group aimed to employ the exact same technique it carried out when review bombing Star Wars: The Last Jedi. One such negative review, posted by a user named Johnnny S., pointed to The Last Jedi's socio-political themes as offensive to white men. "If you like stunning visuals, superficial character development, a choppy, incoherent, illogical plot, plot holes, SJW concepts such as capitalism is bad, animal abuse is bad, 'make love not war', every bad guy being a white male, and neutering every positive protagonist male in this movie, or you are only a casual fan of Star Wars, you'll probably like this movie," he wrote. "If you are a long time die hard like myself who instead of being entertained by visuals, was more interested in the story, plot, and how it ties into the regular canon of the previous movies and have it make sense and not have it riddled with political SJW B.S., then don't see this movie. Pretend it doesn't exist. Wait for the blu-ray and rent it if you must. You will be disappointed." A subsequent study conducted by Dr. Morten Ray as part of his dissertation on politicalization found that roughly 50 percent of criticism directed at The Last Jedi director Rian Johnson was the result of "political trolling, some of it likely from Russia." Research also found that "haters" made up "a small minority" of overall reviews — which applies to both The Last Jedi and Black Panther, as both became critical and commercial successes despite all the controversy and vitriol. Right now, it doesn't appear that these comments have affected Larson directly (we don't know if she even checks RT scores) and probably won't mean too much in the long run. Yes, the reviews are awful to read, but the people posting them likely aren't going to see Captain Marvel anyway. There are millions of fans out there who will — they're all patiently awaiting Captain Marvel's release on March 8, eager to head out to theaters on opening night to support the film and later flood its Rotten Tomatoes profile with reviews. Something tells us the impending response to Captain Marvel from audiences will be positive and uplifting to drown out the hate. Directed by Anna Boden and Ryan Fleck, Captain Marvel will open on March 8.